Blaklion has been ruled out of the Randox Health Grand National after suffering an injury setback. The 10-year-old was set to make his debut for Catterick trainer Phil Kirby and owners Darren and Annaley Yates at Aintree having been bought out of Nigel Twiston-Davies’ yard in February. However, Kirby took him out of the extended four-and-a-quarter-mile feature on Friday morning and the 2017 Becher Chase winner may now be finished for the season. 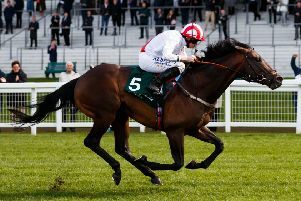 Auxerre bids to show class can outweigh inexperience when the long-time ante-post favourite goes for glory in the Unibet Lincoln Handicap on only his fifth career start at Doncaster this afternoon. The Charlie Appleby-trained gelding has done little wrong so far, winning his last three races after finishing second on his debut, but tackles seasoned campaigners on his reappearance. Appleby had the option of taking Auxerre to Dubai, but felt this was the right move for a horse full of promise. “Everything has gone well and he looks like a progressive performer. Hopefully it will be a nice, sound surface and if it is, he is going to be a lively player,” said the Newmarket handler. “We looked at this race for him at the start of the year. We felt he was off the right mark for it. We had considered taking him to Dubai, but we thought we would leave him back in the UK and have this as an early-season target. “We feel he still has more scope going forward. Whether he makes up to a Group-race horse, we will see further down the line. “I feel he has got enough class to overcome his inexperience. Experience is one thing he doesn’t take into the race. Charlie Fellowes is expecting a big run from Chiefofchiefs, who is fit and raring to go back on turf after three runs on the all-weather during the winter. “He’s in really good form. I think big fields are going to be his forte and I’ve always felt this horse had a nice race in him somewhere,” said the Newmarket handler. Adrian McGuinness reports Salstonstall, the sole Irish challenger, to be in fine shape – but would prefer to see rain to aid his chances. “He’s in great form. He’s very fit. “We’ve done plenty with him. We could do with a bit of rain,” said the County Dublin handler. The five-year-old, who is having his first race since moving to McGuinness from Michael Halford’s stable, is drawn next to Auxerre in stall 18. “All the fancied horses are on one side. “I spoke to someone earlier in the week and they said you want to be where the fancied horses are, so if the favourite is next to mine I want to be beside it,” said McGuinness. John Quinn feels Safe Voyage has claims if he can see out the mile. The Malton trainer said: “He has a squeak. His best form is over seven, but we’ve never really tested him over a mile. “He’s only had the one race (at the trip), which was his last one at Ascot and that didn’t go to plan. “I’m very pleased with how he’s training. “He’s fit and well, his work is good, but he just wouldn’t want the ground too quick. “It was probably the plan to save him for Ascot after he won at Galway, but it was a very dry summer in any case. “He doesn’t need soft ground, just nice ground.